Searching and filtering of uninstallation entries by entering search strings into the filter box. You can sort the list of software packages by their installation date. Using this standard sort order you can see immediately, which software has been installed recently. The sort order can also be changed to any of the other displayed attributes. Launching the program and displaying the list of installed programs is much faster than that of the control panel. The available information varies a bit from installation type to installation type. 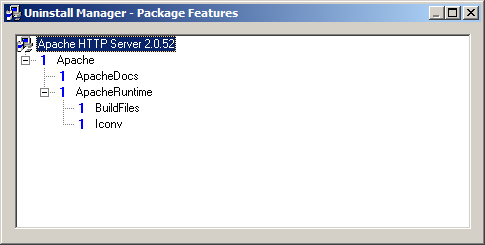 Currently installed features are marked by "1", not installed features are preceded by a "0".